Then, DevOps guru Mark van Holsteijn explains the gist of his session on On Demand Infrastructures For Continuous Delivery. According to Mark, we need those infrastructures for something like DevOps to really succeed. Finally, Olav Maassen shares some information about his new book “Commitment,” a graphic novel about Real Options he wrote with Chris Matts and Chris Geary. The feed is currently being vetted by Apple. Within a few days you’ll probably be able to find the XKC in iTunes and other podcast directories. Can’t wait? Get the feed now! Your feedback is appreciated. Please leave your comments in the shownotes. Better yet, use the FiRe field recording app from Audiofile Engineering to send in a voicemessage as an aiff, wav, or flac file so we can put you ON the show! 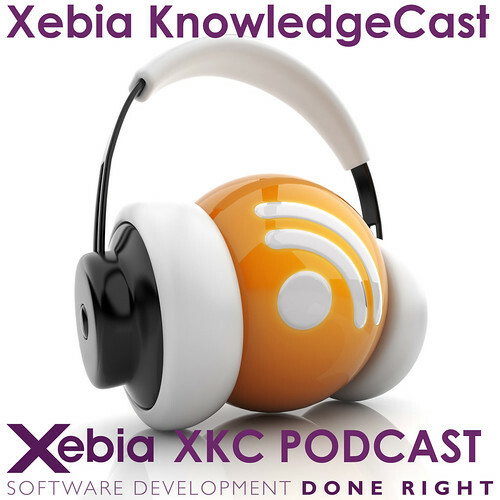 The jingles used in the Xebia KnowledgeCast are made by audionautix.com. All interviews are recorded in double mono with a Marantz Pro PMD661 recorder using an AKG D230 dynamic mic or a Rode NTG2 condenser mic on a boompole resulting in a 96.0 kHz, 24-bit wav file. The fun with stickies section is recorded using the FiRe field recording app from Audiofile Engineering and transferred through SoundCloud. Post production is done on a Macbook Pro using LogicPro with a light voice over filter resulting in a 44.1 kHz, 16-bit mp3 file. Always nice to hear to voices of my old colleagues.